After moving I didn't pick back up my spinning. Mostly because there was a very intense period of extreme busyness, but also because I just didn't feel like it. My knitting always took preference, and so my wheel sat there gathering dust. I did a little spinning here and there, mostly because I felt guilty for neglecting my spinning and decided that I 'should' do it. 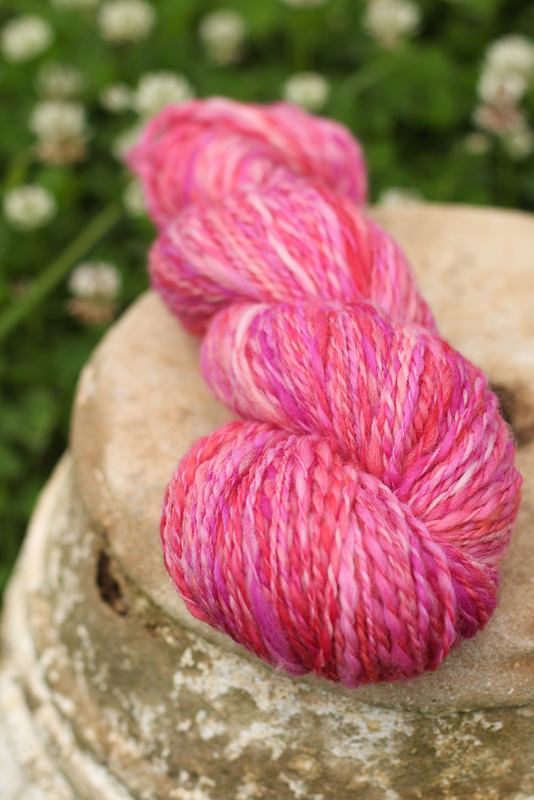 Needless to say, that skein I spun didn't turn out very well. I don't like the colour combination, I don't like the texture, and when I'd spun and plied it, and finished winding it onto the swift, what did it do when I took it off? Twisted terribly. A bad job all around, even for this beginner. In the last two weeks though, I've actually wanted to spin something. I even didn't knit for a few days but sat down with my wheel instead. 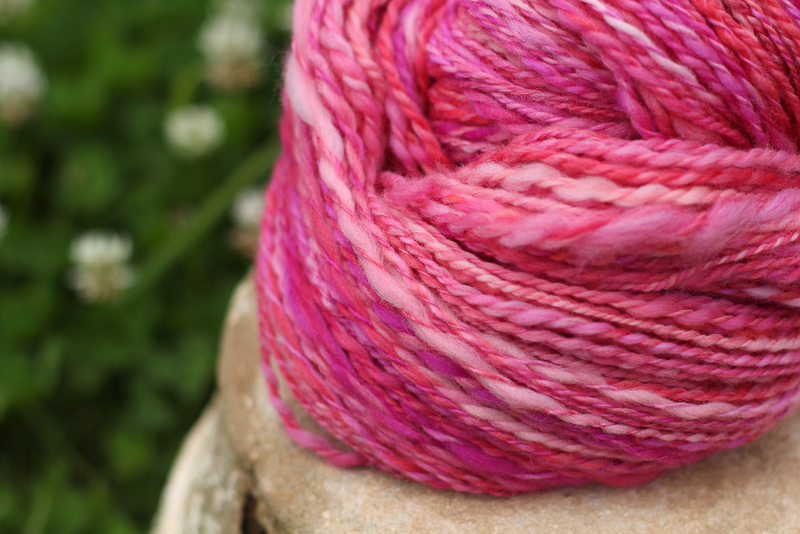 I pulled out the prettiest pink blend of merino roving called Pink Parfait from my fibre stash and started spinning. 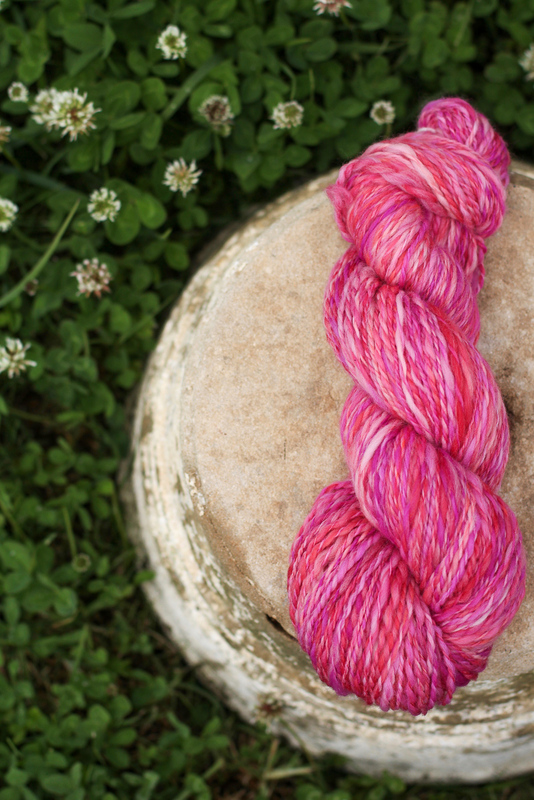 This yarn was spun and plied with joy and excitement, and the resolution that no matter how it turned out, I would knit it into something. I found it interesting when I took it off the swift yesterday, excited to finally get a good look at this 100 grams of fibre I'd turned into yarn, that it didn't twist. It just hung there in perfect straightness. This yarn is, of course, far from perfect, but I'm so happy with it. I love the way the colour turned out, I quite like the thick and thin texture of the spinning and I'm happy that it's not twisting, which means that when I knit it up, the fabric won't pull on an angle and sit strangely. It's got the softest, squishiest texture that just makes you want to hug it. I'm knitting it up into a cowl, which is a project I never thought I'd knit as I don't particularly like them. There isn't enough yarn here to knit a scarf, though, and I think this will knit up quite nicely into a cowl. There are also times this winter when I've had to wear a scarf, but have found the bulk and dangling ends annoying, so I think I will quite like wearing a cowl. 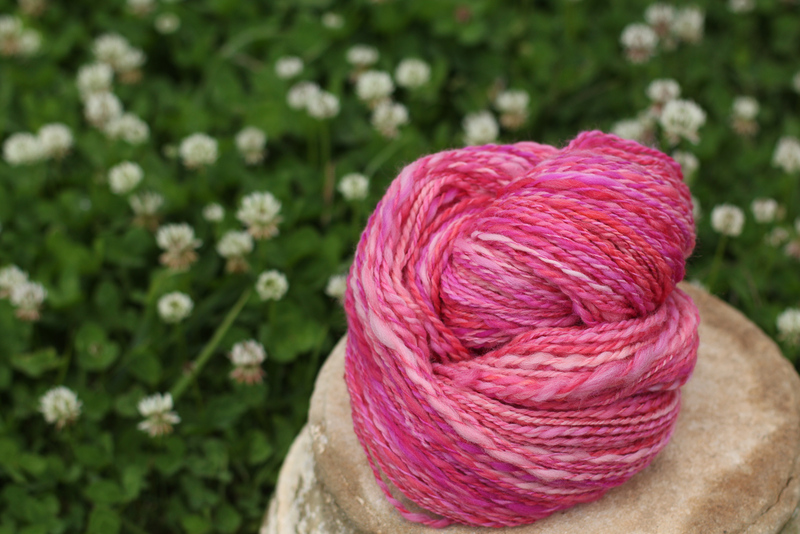 Pink Parfait is so soft and will be nice and warm, and I'm looking forward to using it next winter. I'm knitting it in a basic design so that the yarn can shine. The next thing on my spinning wheel is the loveliest yellow roving. It's such a cheerful colour that I know I'll enjoy spinning it too. And from now on, I won't spin unless I actually feel like it, even if months lapse by. Because I've learnt that for me, spinning is the same as knitting. If I do it for the sake of it, I don't like the results and they won't even be that great. What about you? Can you make for the sake of it? Or does your heart have to be in the project? Thank you, Meg! I've found that, too. The last thing I made when I didn't want to only had simply knitting on it, and later I found a mistake that I haven't made since I was a beginner!